2030 Center - Public policy organization for young people. Alliance for Global Justice - Nurtures organizations seeking fundamental change in international and national conditions that disempower people, create disparities in access to wealth and power, poison the earth, and plunder its resources. Support locally-based grassroots organizing by sharing political analysis, mobilizing for direct action, monitoring the centers of corporate and government power, expanding channels of communication, and sharing skills and infrastructure. American Assembly - A public policy institute at Columbia University. For over 60 years, The Assembly has fostered non-partisan public-policy discussions through convening, research, and publication. Over 100 "American Assemblies" have been held on topics ranging from prison reform to health care to nuclear disarmament. American Enterprise Institute for Public Policy Research - Dedicated to strengthening government, private enterprise, cultural and political institutions, and a strong foreign policy and national defense through scholarly research, open debate, and publications. American Institutes for Research - Behaviorial and scoial science research. American Legislative Exchange Council (ALEC) - Network of 2,400 state legislative members enables like-minded lawmakers to meet their counterparts in other states and exchange ideas on policies and legislation shaping the nation's future. Americas Program - Policy studies center generating a steady flow of commentaries, investigative articles, policy briefs, special reports, think pieces, citizen guides, and other publications on a wide range of policy issues related to hemispheric integration and inter-American affairs. ANSER - Studies issues related to the research, development and acquisition of major Air Force weapon systems. Arms Control Association (ACA) - Provides policy-makers, the press and the interested public with authoritative information, analysis and commentary on arms control proposals, negotiations and agreements, and related national security issues. Aspen Institute, The - Provides neutral ground on which different points of view can be exchanged among diverse leaders from the private sector, government, academic world, media, and elsewhere. Association for Public Policy Analysis and Management (APPAM) - Dedicated to improving public policy and management by fostering excellence in research, analysis and education. With over 1,500 academic, practitioner, organizational and institutional members, APPAM promotes its mission through its annual Fall Research Conference, with the Journal of Policy Analysis and Management (JPAM), the association's journal, several award programs and various activities including international and national conferences and workshops. Atlantic Council of the U.S. - Network of leaders in the policy, academic and corporate communities who assess U.S. foreign policy options and develop non-partisan policy recommendations. Bertelsmann Stiftung - Both a think tank and an agent for social change. Works toward improved education, a just and efficient economic system, a preventative healthcare system, a vibrant civil society and greater international understanding. Bipartisan Policy Center (BPC) - Washington, D.C.-based think tank that actively promotes bipartisanship. Founded in 2007 by former Senate Majority Leaders Howard Baker, Tom Daschle, Bob Dole and George Mitchell. BPC regularly convenes events like Bridge-Builder Breakfasts, political summits and timely policy discussions to foster an ongoing conversation about how to overcome political divides and help make our government work better. Breakthrough Institute - Best known for its work on energy and climate, advocating an innovation-centered approach to national and global energy and climate challenges. Brookings Institution - Economic, government, foreign policy research and analysis. Canadian Centre for Policy Alternatives (CCPA) - An independent, non-partisan research institute concerned with issues of social, economic and environmental justice. Carnegie Endowment for International Peace - Programs of research, discussion, publication, and education in international affairs and U.S. foreign policy. Carnegie Institution for Science - Basic research and advanced education in biology, astronomy, and the earth sciences. Cato Institute - Promotes public policy based on limited government, individual liberty, "free markets" and peace. Center for a New American Security (CNAS) - Washington, D.C.-based national security think tank established in 2007 by co-founders Dr. Kurt M. Campbell and Michèle A. Flournoy. Center for American Progress - Progressive research institute supporting fiscal discipline, shared prosperity, and investments in people through education, health care and workforce training. Center for Equal Opportunity, The (CEO) - Devoted exclusively to the promotion of colorblind equal opportunity and racial harmony. CEO focuses on racial preferences, immigration and assimilation, and multicultural education. Center for Immigration Studies - Think tank devoted to research and policy analysis of the economic, social, demographic, fiscal, and other impacts of immigration on the United States. Center for International Environmental Law (CIEL) - Brings the energy and experience of the U.S. public interest environmental movement to the task of developing international and comparative environmental law, policy, and management around the world. Center for International Policy - Through research, education, and direct public advocacy, CIP works to define and put into practice a more sympathetic, farsighted, and non-militaristic approach to the developing world. Center for Opportunity Urbanism - Promoting suburban growth. Center for Policy Alternatives (CPFA) - Engages a new generation of leaders across the states to envision and realize progressive solutions for America's future. Center for Political Technologies (CPT) - Political and business consulting. One of the oldest independent think-tanks in Russia. Center for Strategic and International Studies, The (CSIS) - A public policy research institution dedicated to analysis and policy impact. CSIS is the only institution of its kind that maintains resident experts on all the world's major geographical regions. It also covers key functional areas, such as international finance, U.S. trade and economic policy, national and international security issues, energy, and telecommunications. Center for Technology in Government (CTG) - Applied research center devoted to improving government and public services through policy, management, and technology innovation. Center for the Study of Social Policy - The Center's work is concentrated in the areas of family and children's services, income supports, neighborhood-based services, education reform, family support, disability and health care policy, and long term care for the elderly. Center on Budget and Policy Priorities (CBPP) - Research and analysis on a range of government policies and programs with an emphasis on those affecting low- and moderate-income people. Center on Juvenile and Criminal Justice System (CJCJ) - Mission to reduce society's reliance on the use of incarceration as a solution to social problems. Center on Wisconsin Strategy (COWS) - Dedicated to improving economic performance and living standards in the state of Wisconsin and nationally. Centre for Analysis of Strategies and Technologies (CAST) - A leading Russian defense industry and arms trade think tank. Its main print publication is the Eksport Vooruzheniy (Arms Exports) journal. Centre for International Economics - A private company operating out of Canberra and Sydney, Australia. It undertakes economic analyses for industry, corporations, government, international agencies, and individuals around the world. Centre for Reform - A UK public policy think tank pursuing the values of the Liberal Democrats, but open to all those who wish to debate social, economic and political reform. Centre for Policy Studies (CPS) - Independent center right think tank which develops and publishes public policy proposals and arranges seminars and lectures on topical policy issues, as part of its mission to influence policy around the world. Founded in 1974 by Margaret Thatcher and Keith Joseph. Century Foundation, The - Conducts public policy research and analyses of economic, social, and foreign policy issues, including inequality, retirement security, election reform, media studies, homeland security, and international affairs. Chatham House - International affairs. Chinese Environmental NGOs - Captures and preserves web sites of non-governmental organizations that address local environmental conditions in China. Committee for Economic Development (CED) - Organization of business and education leaders dedicated to policy research on major economic and social issues. Commonweal Institute - Seeks to maximize the visibility and the power of progressive ideas and values. From environmental protection to racial justice, from religious tolerance to economic security, the Commonweal Institute promotes fundamental American ideals of community, responsibility, and fairness. Conference Board of Canada (CBoC) - Research organization sharing insights on economic trends, public policy and organizational performance. Consumer Energy Council of America (CECA) - Public interest organization focusing on network industries by convening high-level consensus-building forums to help resolve contentious issues in the energy, telecommunications, and water policy realms. Council on Competitiveness - Focuses on strengthening U.S. innovation, upgrading the workforce, and benchmarking national economic performance. Membership is composed of corporate chief executives, university presidents, and labor leaders. National affiliates include nonprofit research organizations, professional societies, and trade associations. Council on Foreign Relations (CFR) - The Council's purpose is to provide insights into international affairs and to develop new ideas for U.S. foreign policy, particularly national security and foreign economic policy. Council on Hemispheric Affairs (COHA) - Research and information organization promoting common interests of the hemisphere and encouraging constructive U.S. policies towards Latin America. COWS - Based at the University of Wisconsin-Madison, COWS is a national think-and-do tank that promotes 'high road' solutions to social problems. These treat shared growth and opportunity, environmental sustainability, and resilient democratic institutions as necessary and achievable complements in human development. Democratic Leadership Council (DLC) - The DLC's mission is to promote public debate within the Democratic Party and the public at large about national and international policy and political issues. Demos - An independent think tank and research institute based in London. Its role is to help reinvigorate public policy and political thinking and to develop radical solutions to long term problems. Directorate for Science and Policy Programs (SPP) - Programs address several objectives of the American Association for the Advancement of Science (AAAS), including furthering the work of scientists, improving the effectiveness of science in the promotion of human welfare, and fostering scientific freedom and responsibility. Drug Policy Alliance - A policy research institute that focuses on broadening the debate on drug policy and related issues. Drug Policy Foundation (DPF) - DPF believes that current drug policy is not working. Economic Analysis and rsearch Network (EARN) - A collaboration of national, state, and regional, advocacy, policy, and research organizations. Economic Strategy Institute (ESI) - Information on the U.S.' trade relationship with Japan, China, Korea, or Europe, transcripts of addresses by the movers and shakers in global business and trade, the latest on the U.S. economy, and information on various economic sectors, including telecommunications, information technology, and passenger aviation. Economists Incorporated (EI) - A consulting firm specializing in microeconomic analysis that provides expert advice to legal counsel, businesses, trade associations, and government agencies. EI economists apply economic analysis to policymaking, regulatory issues, and public and private litigation. Employee Benefit Research Institute (EBRI) - Data dissemination, policy research, and education on economic security and employee benefits. European Council on Foreign Relations (ECFR) - Pan-European think-tank, research institute and advocacy group. It has been set up to engage in European foreign policy research, and to promote a more integrated European foreign policy in support of shared European interests and values. Also see Publications. Employment Policies Institute (EPI) - Dedicated to studying public policy issues surrounding employment growth. Environmental Law Institute (ELI) - Research and education center focusing on environmental law, policy, and management - domestically and abroad. European Foundation - Comment and analysis on European integration. European Foundation for the Improvement of Living and Working Conditions - The Foundation carries out research and development projects, to provide data and analysis for informing and supporting the formulation of EU policy on working and living conditions. Case studies, national reports, surveys. European Institute: Europe in Washington - Members of the European Institute include 24 governments and over 75 multinational corporations. Contributors are private foundations, program sponsors and individuals. The Institute serves as a neutral and informal channel of communication between government representatives, business leaders, and individual members. European Leadership Network (ELN) - A pan-European think-tank focusing on European foreign, defence and security issues based in London, United Kingdom. European Policy Centre (EPC) - A think tank committed to enhancing European integration. Fabian Society - UK membership based left of center think tank exploring political ideas and policy reforms that may define progressive politics in the future. Federal Trust, The (UK) - Studies the interactions between regional, national, European and global levels of government. Fiscal Policy Institute (FPI) - A nonpartisan research and education organization that focuses on the broad range of tax, budget, economic and related public policy issues that affect the quality of life and the economic well-being of New York State residents. Foreign Policy Centre - Publications, events programs, quarterly magazine Global Thinking, internship program, research. Foreign Policy Research Institute (FPRI) - Conducts researchs on pressing issues- the war on terrorism, developments in the Middle East, nuclear proliferation, relations with China, Russia, and Japan- and long-term questions, such as the roles of religion and ethnicity in international politics, or the nature of Western identity and its implications for the U.S. and the Atlantic Alliance. Fund for Peace - Promotes education and research on global problems threatening human survival. Gas Technology Institute (GTI) - Energy and environmental research, development, and education. George C. Marshall Institute (GCMI) - Dedicated to providing technical analyses of scientific issues impacting public policy. Global Public Policy Institute (GPPi) - Think tank based in Berlin. Seeks to improve global governance through research, policy advice and debate. Gorbachev Foundation - Created by Mikhail Gorbachev, former President of the USSR. Its inauguration took place in March 1992. The Foundation became one of the first independent think-tanks in the post-Soviet Russia. The Foundation's main mission is to provide in-depth analysis of the evolving social, economic and political situation in Russia and in the world. Guttmacher Institute - Provides reliable, balanced, nonpartisan information on sexual activity, contraception, abortion, and childbearing. Henry L. Stimson Center - Public policy institute committed to promoting innovative solutions to security challenges confronting the U.S.
Heritage Foundation - Committed to rolling back the "liberal welfare state" and building an America where freedom, opportunity, prosperity, and civil society flourish. Hudson Institute - Public policy research organization whose viewpoint embodies skepticism about conventional wisdom, an appreciation of technology's role in achieving progress, optimism about solving problems, a futurist orientation, a commitment to individuality and free institutions, and a respect for the importance of religion, culture, and values in human affairs. Igarape Institute - Developing evidence-based solutions to promote security and development. Committed to preventing and reducing violence and enhancing social and economic opportunities. Works across several themes: Citizen Security, Drug Policy, Cyber Security, Building Peace, Sustainable Development and Global Networks. Bbased in Rio de Janeiro. Illinois Institute of Technology Research Institute (IITRI) - One of the country's largest not-for-profit contract research institutes. Core competencies center around Electromagnetic Engineering, Information Technology, Life Sciences, Telemedicine, Material Sciences, Manufacturing Technology, Chemical Technology, and Transportation Technology. In the Public Interest (ITPI) - A research and policy center on privatization and responsible contracting. Independent Institute - Public policy research and debate. Resulting studies are distributed as books, in the Institute's quarterly journal, The Independent Review, in periodic Independent Policy Reports, and other studies. Conferences, forums, and media events sponsored by the Institute bring scholars and policy experts together to debate policy issues. India Foundation - Research center focussed on the issues, challenges and opportunities of the Indian polity. Seeks to articulate Indian nationalistic perspective on issues. Information Technology and Innovation Foundation (ITIF) - Formulates and promotes public policies to advance technological innovation and productivity internationally. Publishes policy reports, holds forums and policy debates, advises elected officials and their staff, and is an active resource for the media. Institute for Defense Analysis (IDA) - Primary mission is to assist the Office of the Secretary of Defense, the Joint Staff, the unified commands and defense agencies in addressing national security issues, particularly those requiring scientific and technical expertise. Institute for Food and Development Policy (Food First) - Food First's work highlights root causes and value-based solutions to hunger and poverty around the world, with a commitment to establishing food as a fundamental human right. Institute for Foreign Policy Analysis - Research and strategic planning organization specializing in issues of national security, foreign policy, political economics, and government-industrial relations. Institute for Policy Integrity - A non-partisan advocacy organization and think-tank dedicated to improving the quality of governmental decisionmaking. Based out of the New York University School of Law. Institute for Policy Studies (IPS) - Striving to create a more responsible society - one built around values of justice, nonviolence, sustainability, and decency. Institute for Public Policy research (IPPR) - UK progressive think tank. Institute of Democracy and Cooperation - A think-tank based in Paris and funded by Russian NGOs and charitable foundations. It aims to be part of the debate about the relationship between state sovereignty and human rights; about East-West relations and the place of Russia in Europe; about the role of non-governmental organisations in political life; about the interpretation of human rights and the way they are applied in different counties; and about the way in which historical memory is used in contemporary politics. Institute of Modern Russia - Think tank specializing on Russia: research, advocacy, public events, and grant-making. offices in New York and Washington, D.C.
Interhemispheric Recource Center (IRC) - A policy studies center that develops strategic analysis in the form of policy briefs, special reports, talking points, commentaries, and similar materials. IRC also maintains several electronic listservs that allow us to disseminate information and analysis and network with partners and other organizations across the globe, including The Progressive Response, crossborder UPDATER, and Self-Determination Conflict Watch. International Crisis Group (ICG) - An independent, non-profit, multinational organisation, with over 90 staff members on five continents, working through field-based analysis and high-level advocacy to prevent and resolve deadly conflict. International Forum on Globalization (IFG) - Think tank advocating democratic and ecologically sustainable economics. International Foundation for Election Systems (IFES) - Governments, legislatures, multi-national organizations, nongovernmental organizations, educational institutions, political parties, and independent researchers use IFES pre-election assessments as guides for understanding the political, social, and economic environment surrounding electoral events. International Law Institute (ILI) - Scholarly research, publishing, practical legal training, and technical assistance on international legal and economic policy. Investor Responsibility Research Center (IRRC) - Research on companies and shareholders worldwide. Israel/Palestine Center for Research and Information (ICPRI) - IPCRI, founded in Jerusalem in 1988, is the only joint Palestinian-Israeli public policy think-tank in the world. Japan Economic Institute of America (JEI) - Authoritative source for current information on the Japanese economy, Japanese politics, Japanese foreign policy and U.S.-Japan relations. Jerusalem Center for Public Affairs (JCPA) - A public policy think tank devoted to research and analysis of issues facing the Middle East. Leaders of a Beautiful Struggle (LBS) - A grassroots think-tank which advances the public policy interest of Black people, in Baltimore, through youth leadership development, political advocacy, and autonomous intellectual innovation. Levy Institute - Bard College public policy research organization. Lowy Institute for International Policy - Conducts original, policy-relevant research about international political, strategic and economic issues from an Australian perspective. Ludwig von Mises Institute - Research and educational center of classical liberalism, libertarian political theory, and the Austrian School of economics. It is the mission of the Mises Institute to restore a high place for theory in economics and the social sciences, encourage a revival of critical historical research, and draw attention to neglected traditions in Western philosophy. In this cause, the Mises Institute works to advance the Austrian School of economics and the Misesian tradition, and, in application, defends the market economy, private property, sound money, and peaceful international relations, while opposing government intervention as economically and socially destructive. Manhattan Institute for Policy Research - Supports and publicizes research on public policy issues: taxes, welfare, crime, the legal system, urban life, race, education, and many other topics. Middle East Institute (MEI) - Conduit of information between Middle Eastern nations and American policy makers and organizations. National Academy of Engineering (NAE) - Provides engineering leadership in service to the nation. Articulates the implications of rapid technological change affecting the way people work, learn and play. National Academies - Advisors to the nation on science, engineering, and medicine. National Center for Policy Analysis (NCPA) - Develops and promotes private alternatives to government regulation and control, solving problems by relying on the strength of the competitive, entrepreneurial private sector. Topics include reforms in health care, taxes, Social Security, welfare, criminal justice, education and environmental regulation. National Center for Public Policy Research (NCPPR) - Conservative "free market" foundation. National Council of La Raza (NCLR) - NCLR's Policy Analysis Center is a Hispanicthink tank" serving as a voice for Hispanic Americans in Washington, D.C.
National Institute for Research Advancement - An independent policy research body established on the initiative of leading figures from Japan's industrial, academic and labor communities. It's research focuses on current and emerging issues in many areas, including politics, economics, international affairs, society, new technologies, and administration. National Security Archive - A research institute on international affairs, a library and archive of declassified U.S. documents obtained through the Freedom of Information Act, a public interest law firm defending and expanding public access to government information through the FOIA, and an indexer and publisher of the documents in books, microfiche, and electronic formats. Nautilus Institute - A policy-oriented research and consulting organization. Core staff are based in Berkeley, with associates in several locations throughout the world. Research is drawn from many disciplines, including environmental economics and science, energy and resource planning and international relations. Nelson A. Rockefeller Institute of Government - Public policy research arm of the State University of New York. The work of the Institute focuses on the role of state governments in the American federal system. New America Foundation - Public policy institute whose purpose is to bring exceptionally promising new voices and new ideas to the fore of America's public discourse. New Democracy Project (NDP) - A New York City-based national/urban affairs public policy institute. Through innovative and well-publicized research, NDP seeks to provide policymakers and the public with thoughtful solutions that promote democratic participation, economic fairness and social justice. New Economics Foundation (NEF) - An independent 'think and do' tank. "We believe in economics as if people and the planet mattered." Next System Project, The - An initiative of The Democracy Collaborative, working with a broad group of researchers, theorists and activists to promote visions, models and pathways that point to a "next system" radically different in fundamental ways from the failed systems of the past and present and capable of delivering superior social, economic and ecological outcomes. Northeast-Midwest Institute - A Washington-based, private, non-profit, and non-partisan research organization dedicated to economic vitality, environmental quality, and regional equity for Northeast and Midwest states. Conducts research and analysis, develops and advances innovative policy, providing evaluation of key federal programs, disseminating information, and highlighting sound economic and environmental technologies and practices. Oakland Institute - A policy think tank whose mission is to promote fair debate and increase public participation by bringing dynamic new voices into policy debates on critical economic and social issues. Open Europe - An independent think tank, with offices in London and Brussels, set up by leading UK business people to contribute positive new thinking to the debate about the future direction of the European Union. Overseas Development Institute (ODI) - Independent think-tank on international development and humanitarian issues. Oxford Research International - Provides research in the transition economies of Central and Eastern Europe, the CIS, Central Asia, China, South East Asia, the Middle East and Africa. Pacific Institute - A global water think tank, provides science-based thought leadership with active outreach to influence local, national, and international efforts in developing sustainable water policies. It actively advances solutions to some of the world's most intractable water-related problems, such as water management and use, climate change, environmental degradation, food, fiber, and energy production, and lack of access to fresh water and sanitation. Peterson Institute for International Economics (PIIE) - The Institute's staff of about 50 includes more than two dozen senior fellows, who are widely viewed as one of the top groups of economists at any research center. Its agenda emphasizes global macroeconomic topics, international money and finance, trade and related social issues, energy and the environment, investment, and domestic adjustment policies. Current priority is attached to the global financial and economic crisis, globalization (including its financial aspects) and the backlash against it, international trade imbalances and currency relationships, the creation of an international regime to address global warming and especially its trade dimension, the competitiveness of the United States and other major countries, reform of the international economic and financial architecture, sovereign wealth funds, and trade negotiations at the multilateral, regional, and bilateral levels. Institute staff and research cover all key regions-especially Asia, Europe, Latin America, and the Middle East, as well as the United States itself and with special reference to China, India, and Russia. Polish Institute of International Affairs (PISM) - Promotes the flow of ideas that inform and enhance the foreign policy of Poland. Political Economy Research Institute (PERI) - A leading source of research and policy initiatives on issues of globalization, unemployment, financial market instability, central bank policy, living wages and decent work, and the economics of peace, development, and the environment. Progressive Policy Institute (PPI) - Mission to define and promote a new progressive politics for America in the 21st century, fashioning a new governing philosophy and an agenda for public innovation geared to the Information Age. Progressive States Network - The mission of the Progressive States Network is to pass progressive legislation in all fifty states by providing coordinated research and strategic advocacy tools to forward-thinking state legislators. R Street Institute - Policy research and outreach to promote free markets and limited, effective government. RAND - Research in national defense, education and training, health care, criminal and civil justice, labor and population, science and technology, community development, international relations, and regional studies. Also see Rand Corporation Publications. Resources for the Future - Research in economics and other social sciences and on environmental and natural resource issues. Reut Institute, The - Designed to provide real-time, long-term strategic decision-support to Israeli policymakers. Roosevelt Institute, The - Promotes the legacy and values of Franklin and Eleanor Roosevelt. Its Four Freedoms Center think tank promotes progressive policy ideas and value narratives, and deploys the people who are their strongest proponents into the public debate. The Campus Networkand Pipeline are develop progressive leaders by engaging a whole generation, with 12,000 students on more than 100 college campuses nationwide, and 14 chapters of young professionals in cities from Detroit to New Orleans. The FDR Library promotes a range of programs that attract new audiences to the ideals and values of Franklin and Eleanor Roosevelt. San Francisco Planning and Urban Research (SPUR) - Promotes good planning and good government through research, analysis, public education, and advocacy. South Centre - An ntergovernmental organization of developing countries that helps developing countries to combine their efforts and expertise to promote their common interests in the international arena. Working on issues such as development policies, sustainable development, climate change, global governance, economic and social development, South-South cooperation, global economic conditions, intellectual property, technology transfer, access to knowledge, health, trade agreements and food security. SRI International - Researchers, scientists, technologists, and business consultants creating and bringing new discoveries to market. Stiftung Wissenschaft und Politik (aka (German Institute for International and Security Affairs - SWP) - Analysis on foreign policy issues. While the SWP initially dealt primarily with issues of disarmament, today there is a broad spectrum of analysis ranging from classic security policy issues to aspects of climate protection and the political challenges associated with resource scarcity. Since 2009, the SWP, Europe's largest think tank, has had its representative office in Brussels, and has valued the lively exchange with other European institutes. StinkTanks - Reports on the State Policy Network, a web of so-called 'think tanks' that push a right-wing agenda in every state across the country. Although many of SPN's member organizations claim to be nonpartisan and independent, an in-depth investigation by non-profit, non-partisan investigative reporting groups the Center for Media and Democracy and Progress Now reveals that SPN and its affiliates are major drivers of the right-wing, ALEC-backed agenda in state houses nationwide, with deep ties to the Koch brothers and the national right-wing network of funders, all while reporting little or no lobbying activities. SPN largely pushes a right-wing, corporate-backed agenda aimed at attacking the middle class: privatizing public schools, blocking expanded access to health care, lowering taxes for corporations and the very wealthy, undermining workers' rights and unions, and a polluter's agenda that attacks environmental protections, advocated for voter suppression laws. Stockholm Environment Institute (SEI) - Environment and development issues at local, national, regional and global policy levels. Stockholm International Peace Research Institute (SIPRI) - Conducts research on questions of conflict and cooperation of importance for international peace and security, with the aim of contributing to an understanding of the conditions for peaceful solutions of international conflicts and for a stable peace. Strategic Foresight Group - Research in geopolitical, economic, technological and societal changes. Examines future trends and discontinuities in spaces where geopolitics intersects with business, economy, society, religion and technology. Federal Advisory Committees - These groups, sometimes referred to as commissions, are a form of think tank dedicated to advising the US Presidents or the Executive branch of government. They typically focus on a specific issue and as such, might be considered similar to special interest groups. However, unlike special interest groups these committees have come under some oversight regulation and are required to make formal records available to the public. 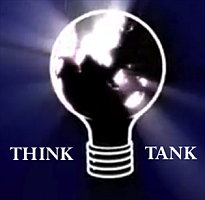 On Think Tanks - Blog concerning think tanks in developing countries. Also see this FACA Search page provided by FIDO GOV. Sourcewatch - Backgrounder and resources, including listing and further information on think tanks worldwide. Think Tank Review - Promotes and critiques the work of UK think tanks in an accessible, open manner. Think Tank Search - from Harvard Kennedy School Library. Transparify - Provides a global rating for the financial transparency of major think tanks. See its publications page. Wikipedia - Backgrounder and resources. Also provides a List of Think Tanks. Transnational Institute - TNI seeks to create and promote international co-operation in analysing and finding possible solutions to such global problems as militarism and conflict, poverty and marginalisation, social injustice and environmental degradation. United Nations University - The University undertakes research and training on a broad range of issues: food and nutrition, information technology, land use and climate change, the freshwater crisis, managing international financial flows, the challenges of urbanization, the legitimacy of international organizations, the causes of complex humanitarian emergencies. Urban Institute - Investigates social and economic problems and analyzes efforts to solve them. Urban Think Tank - A nonpartisan, community-based home for a body of thinkers in the Hip Hop generation that analyzes and frames political, economic and cultural issues, particularly those of concern to people of color, from the perspective of the Hip Hop generation. Woodrow Wilson Center - Memorializes Woodrow Wilson by supporting scholarship and linking that scholarship to issues of concern to official Washington. World Future Council (WFC) - Consists of 50+ respected personalities from all five continents. They come from governments, parliaments, the arts, civil society, science and the business world. Researches future just policies and legislation, then advises political decision-makers, offers them tried and tested courses of action, and supports them in the concrete implementation of new policies. World Sustainable Development Web Archive - Preserves web content published by non‐governmental organizations focusing on environmental and economic sustainability materials. Worldwatch Institute - Informs policymakers and the public about emerging global problems and links between the world economy and its environmental support systems. This webpage last updated on Monday, January 21, 2019 12:07 PM.